How does an alga move upstream? I’m curious because, I am now seeing populations of Lemanea fluviatilisabout four kilometres further upstream in the River Ehen than when I first started my regular visits in 2013. I can explain the presence of the organism partly through changes in the hydrology of the river: a small tributary, Ben Gill, that had been diverted into the lake in Victorian times was reconnected to the river in 2014 and this introduced periodic pulses of intense energy to the river that had immediate effects on the substrate composition. Lemanea fluviatilisis a species that thrives in the fastest-flowing sections of streams so I am quite prepared to believe that even a small shift in the hydrology of this very regulated river might make the habitat more conducive. But that does not explain how it got there in the first place. If the alga was occurring a few kilometres further downstream we would not have any such problems: the upstream populations would provide innocula and, if the habitat conditions changed at the downstream location, then some of those propagules might be able to establish at the downstream locations. But what about movement in the other direction? Water:the linear flow of the river means that it is almost impossible for the downstream population to provide inocula for the new upstream locations. It may be possible for populations from further upstream in the catchment to seed the new locations. I have not seen Lemaneain any of the streams that flow into Ennerdale Water (from which the Ehen emerges) but my knowledge of the catchment is not exhaustive. Likelihood: very low to low. Young shoots of Lemanea fluviatillis(bottom right) growing on a submerged boulder in the River Ehen at a location where I have not previously seen it. These are growing alongside thick growths of diatoms (yellow-brown in colour) and patches of green filamentous algae. Organisms:much of the older literature is concerned with the possibility of living algae or their propagules being transported in mud attached to bird’s feet or feathers and this cannot be ruled out. There is also a recent study showing how mink may act as a vector for Didymosphenia geminata in Chile. The Ehen also has aquatic mammals (such as otters) that could be acting as vectors for Lemanea, as well as migratory fish such as salmon and trout that could move propagules upstream. There is also some evidence that some algae can survive passage through mammalian and invertebrate guts, and this, too, may provide a means for Lemaneato spread upstream. Likelihood: low to medium. Air currents / wind:quite a lot has been written about airborne dispersal of algae, with even Darwin making a contribution (see reference in Kristiansen). The key hazard in airborne dispersal is desiccation so, in the case of Lemanea, the most likely lifecycle stages that could be dispersed in this way would be the diploid carpospores or haploid monospores. This, however, would assume that there were times during the year when the relevant life-cycle stages were exposed and, as Lemaneais a species that I usually find in the Ehen only fully-submerged, this is not very feasible. Likelihood: low. Human activity:there is evidence that Didymosphenia geminatacan be transported between sites attached to waders and new records often correspond with patterns of recreational use (references in Bergey & Spaulding – see below). When we work in the Ehen we prefer to move downstream in order to minimise the risk of moving organisms on our kit, and we also clean our kit before we start. However, a lot of people work in this part of the Ehen and it only takes one dirty wader to introduce a propagule. Likelihood: low to medium. We’ll almost certainly never know for sure why Lemanea fluviatilisis now thriving four kilometres further upstream than it was five years ago. It is, however, worth bearing in mind that, given enough time, even a low probability may yield a positive result. So none of the four hypotheses can be ruled out for sure. Three of the possibilities are entirely natural, with one – movement by the stream itself – being constrained by the direction of flow. Biological vectors look like a very plausible means of moving algal propagules around catchments but, for this to work, we need wildlife-friendly corridors around the river to support the animals and birds. The upper Ehen has these, but many other rivers do not. Actually, having a number of options all with a relatively low likelihood adds to the sense of mystery that every ecologist should have when they approach the natural world. When cause and effect are too predictable, we tend to focus on engineering the right “solution”. The truth, in our muddled and unpredictable world, is often that nudging several factors in the right direction will give us a more resilient outcome, even though we may have to wait longer for it to happen. Bergey, E.A. & Spaulding, S.A. (2015). Didymosphenia: it’s more complicated. BioScience65: 225. Kristiansen, J. (1996). 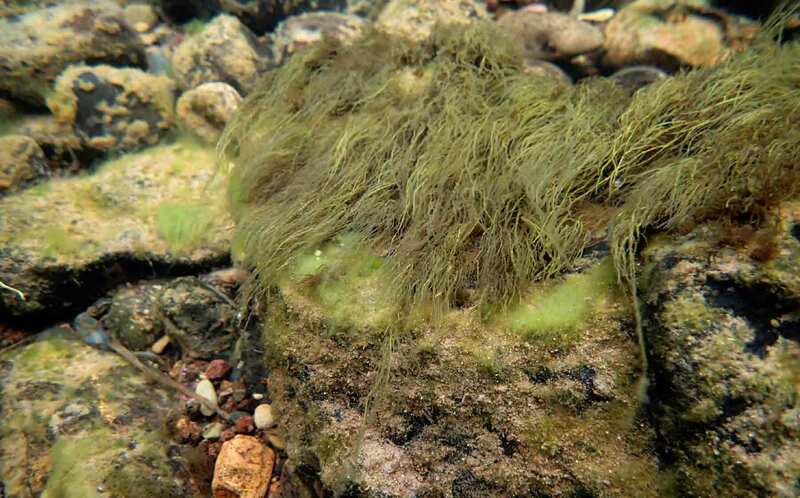 Dispersal of freshwater algae – a review. Hydrobiologia336: 151-157. Leone, P.B., Cerda, J., Sala, S. & Reid, B. (2014). Mink (Neovision vision) as a natural vector in the dispersal of the diatom Didymosphenia geminata. Diatom Research29: 259-266. Raven, J.A. (2009). The roles of the Chantransia phase of Lemanea (Lemaneaceae, Batrachospermales, Rhodophyta) and of the ‘Mushroom’ phase of Himanthalia (Himanthaliaceae, Fucales, Phaeophyta). Botanical Journal of Scotland46: 477-485. At the end of my last post I suggested that the next time I wrote it may be from Portugal. In reality, tiredness and, to be frank, a steady consumption of Vino Verde intervened and this post may be about Portugal but is not, alas, written from that country. Our travels took us from Lisbon northwards to Covilhã, a town on the edge of the Serra da Estrela mountain range, then onwards to the Duoro valley and Porto, and finally back to Lisbon. The lower part of the Duoro is the home to many of the Vino Verde vineyards, although our focus was mostly on the vineyards further upstream from which the grapes for port are grown. 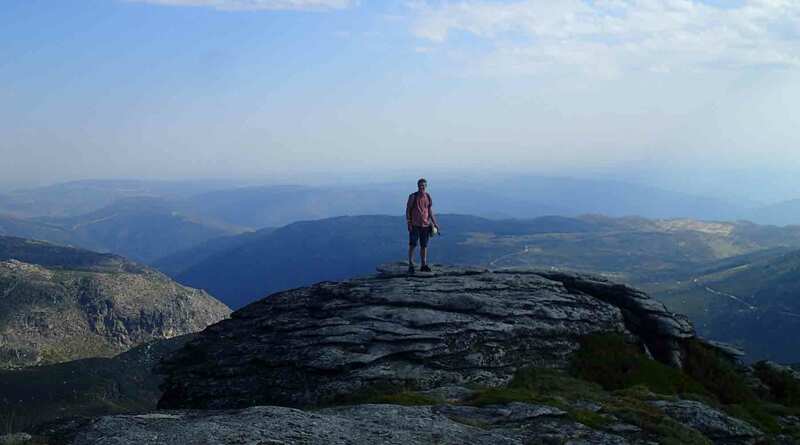 I’ll write more about the Duoro in a later post but, first, I want to take you on a journey to the Serra da Estrela. These are the highest mountains in mainland Portugal (there is a higher point in the Azores) with a summit at 1993 metres at Torre. Unusually, for the highest peak in a mountain range, there is a road all the way to the top, along with a couple of shops and a small bar/restaurant. On the day we visited, a couple of hardy cyclists had toiled their way up from the plains but most of the visitors had driven up. We had stopped on our route up from Covilhã to explore the granite landscape and botanise so felt that we had earned our bica and Pastéis de Nata by the time we got to the very top. 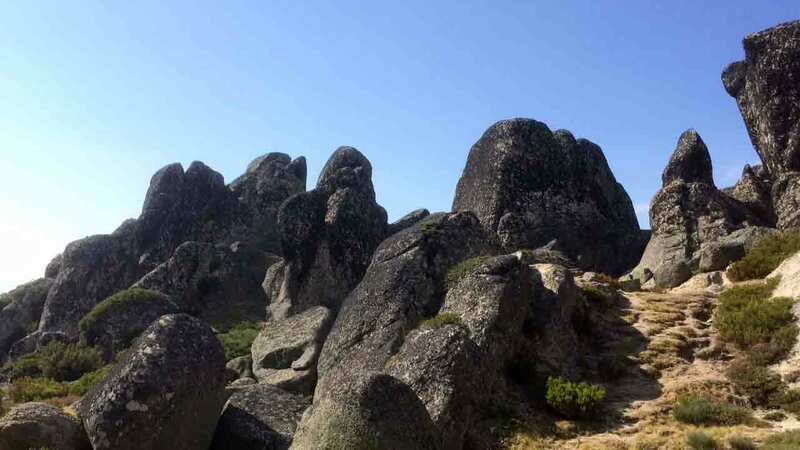 Much as I appreciate a summit that satisfies a caffeine addiction, the real interest lies elsewhere, with the road up from Covilhã passing through some dramatically-eroded granite outcrops, composed of huge boulders apparently perched precariously on top of each other. These resemble the granite “tors” we find in Dartmoor in south-west England, and have a similar origin. The area around the tors had distinctive vegetation that will, no doubt, be described in greater length in a post on Heather’s blog before too long. The free-draining sandy soils that the granite landscape creates mean that there was not a lot of surface water for me to indulge my own passions, so I will have to take you to another part of the Serra da Estrela for the remainder of this post. 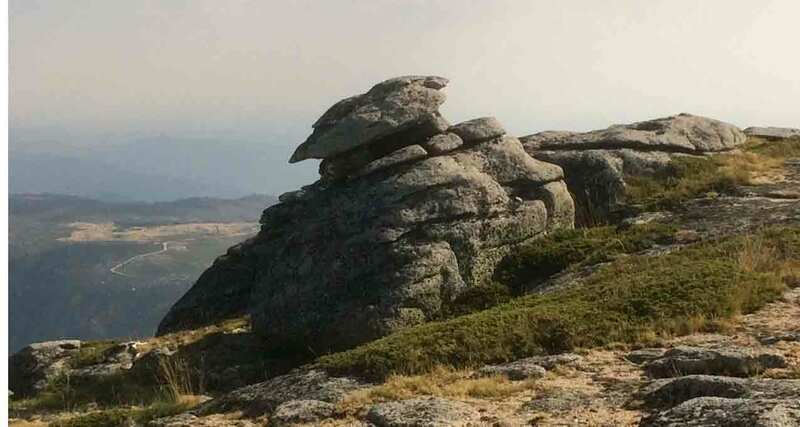 Granite landscapes near Torre in the Serra da Estrela Natural Park in northern Portugal, September 2018. We found an inviting stream as we were walking near Unhais de Serra, at the southern end of the Natural Park. The first plants to catch our eye were a submerged Ranunculus species with finely-divided leaves and five-petelled white flowers sitting at the water surface. As well as these, we could see shoots of patches of water dropwort (Oenanthe sp.) and, looking more closely, several of these appeared to be growing out of dark coloured patches which turned out to be a submerged moss overgrown with algae (more about which a little later). I am guessing that, once the rains come, much of these mini-ecosystems will be washed downstream leaving just a few moss stems to be colonised again next year. Submerged vegetation in the stream at Unhais de Serra in September 2018 (40°15’44” N 7°37’21” W). 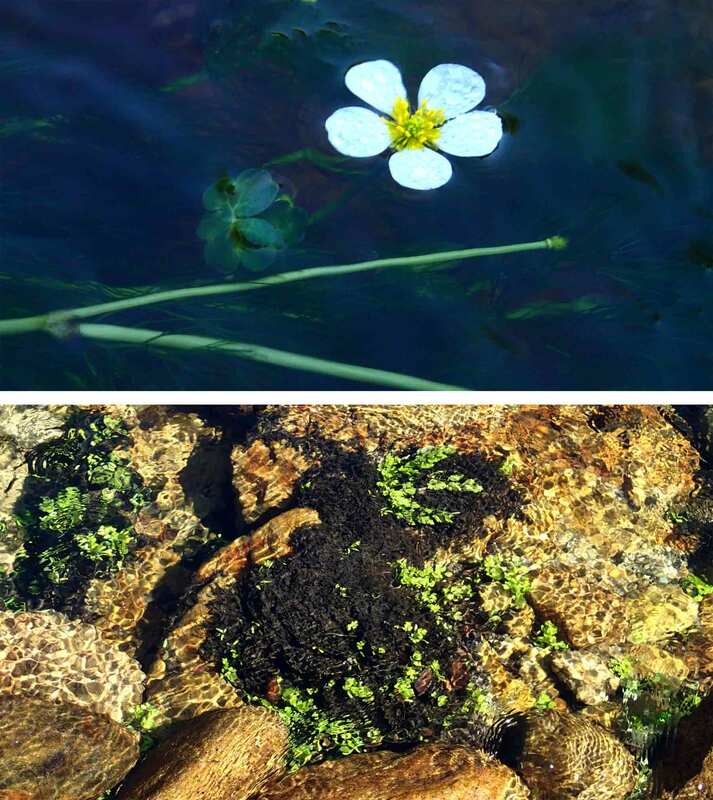 The top photograph shows a Ranunculus species and the lower photograph shows mosses overgrown with algae (a mixture of Cyanobacterial filaments, diatoms and coccoid green algae), within which young plants of Oenanthe sp. have taken root (top photograph: Heather Kelly). Somewhat to my surprise there were also some patches of Lemanea. This is a red algal genus that I usually associate with late winter and spring in my own part of the world, so I had not expected to find such prolific growths at this time of year at lower latitudes. Maybe Iberian species of Lemanea behave differently to those with which I am familiar? The Lemanea species found in the stream at Unhais de Serra in September 2018. The top photograph shows it growing in situ and the lower photograph is a close-up. The filaments are about a millimetre wide. 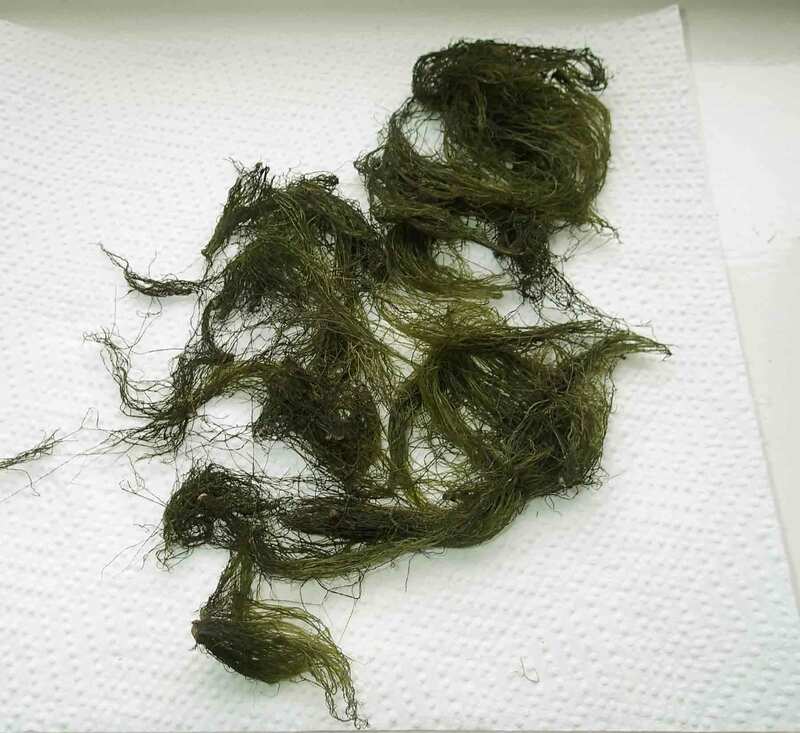 The dark film itself contained a variety of algae, some of which I have put in a plate below. There were some cyanobacterial filaments which looked like Oscillatoria to me but which were not moving (their life between collection and examination was less than ideal). There were also a large number of diatoms, mostly Navicula and Surirella. Again, both would have been moving around in a healthy sample but were static when I got around to examining them; the chloroplasts in the Surirella, in particular, were not in very good condition). I also saw some chains of Fragilaria species and several small green algae (especially Monoraphidium, discussed in the previous post). I’ll return to the diatoms in a future post, once I have been able to get permanent slides prepared and examined but first impression is that I am looking at a community from a low nutrient, circumneutral environment. Some of the algae living in the dark films overgrowing mosses in the stream at Unhais de Serra in September 2018. a. – c.: Navicula angusta; d. –g. Surirella cf. roba; h. – i. two different chain-forming Fragilaria sp. ; j. – k.: Navicula cf cryptocephala; l. – m.: Oscillatoria sp. Scale bar: 20 micrometres (= 1/50th of a millimetre). 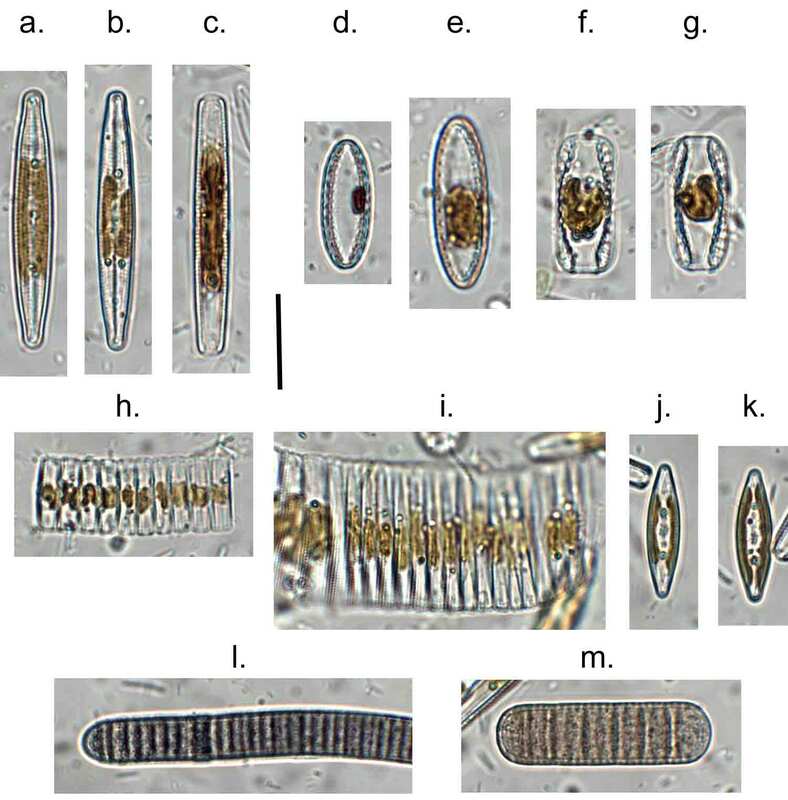 The diatoms, in particular, reiterate the important point that notwithstanding the huge number of new species that have been described in recent years, it is possible to peer through a microscope at a sample from anywhere in Europe and see a familiar set of outlines that, for the most part, give a consistent interpretation of environmental conditions wherever you are (see, for example, “Lago di Maggiore under the microscope”). That same rationale applies, to some extent to other organism groups too: we have recently shown this for macrophytes in shallow lakes for example. Likewise, the geology here was shaped by the same broad forces that created the landscape of south-west England even if local climate means that the flora surrounding the tors in the Serra da Estrela is adapted to more arid conditions than that on Dartmoor. It is important that, when we travel, we see the differences but, perhaps even more important in this fractured age, that we see the similarities too. Chapuis, I.S., Sánchez-Castillo, P.M. & Aboal Sanchero, M. (2014). Checklist of freshwater red algae in the Iberian Penisula and the Balearic Islands. Nova Hedwigia 98: 213-232. Poikane, S., Portielje, R., Deny, L., Elferts, D., Kelly, M., Kolada, A., Mäemets, H., Phillips, G., Søndergaard, M., Willby, N. & van den Berg, M. (2018). Macrophyte assessment in European lakes: Diverse approaches but convergent views of ‘good’ ecological status. Ecological Indicators 94: 185-197. I have already tried Lemanea with pasta so today’s experiment was with risotto: one of my favourite Italian dishes both to eat and to cook. I cooked a standard risotto bianco then, towards the end of the cooking period, added a handful of fresh prawns and a generous handful of chopped Lemanea (for two people). I stirred it around whilst the prawns cooked, and to make sure that the Lemanea was distributed throughout the dish. Once the stock had been absorbed, I removed the risotto from the heat and stirred in some butter and Parmesan cheese. I used this time to pan-fry two trout fillets to serve with the risotto. 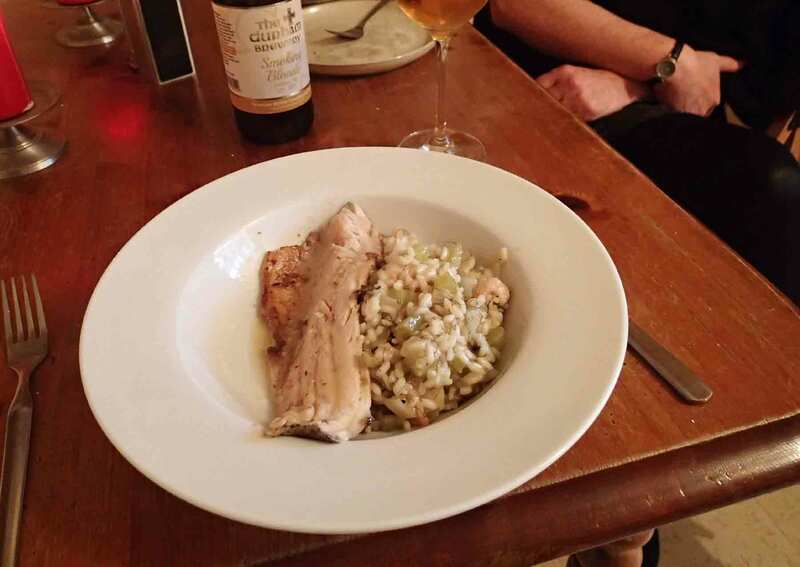 Risotto with Lemanea and prawns, served with pan-fried trout and a bottle of Durham Brewery’s Smoking Blonde ale. 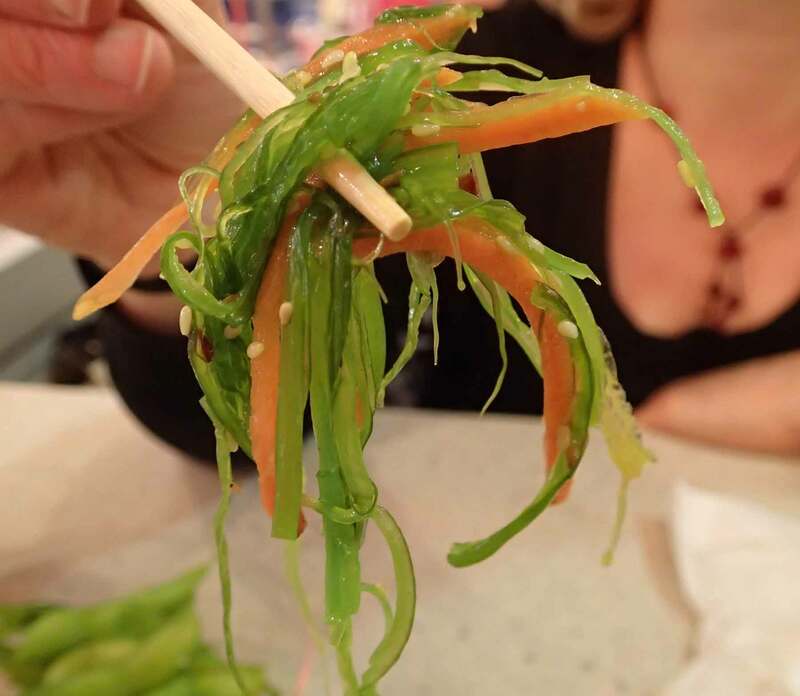 Once again, the gently fishy flavour of the alga balances the taste of freshwater fish really well although, in retrospect, smoked fillets would have been better. However, all my fishmonger had were some rather bland rainbow trout from a fish farm. The prawns add extra flavour and texture to the dish and led me to wonder if the dish might also work really well with freshwater crayfish. Rather than open a bottle of white wine with the risotto, we followed up a lesson we learned the evening before at Blackfriar’s restaurant in Newcastle, where we had a meal where every course was complemented by a carefully-selected beer. The fish course was complemented superbly by Durham Brewery’s “Smoking Blonde”, a golden ale made with smoked wheat, which introduces to the beer the complex aromas I associate with Islay whisky. I gain a double pleasure from recommending a beer from Durham Brewery: it is situated within walking distance of my house and they started in business at about the same time as me. I first encountered them, in fact, on a course where we got a basic training in business methods together. “Smoking Blonde” celebrates their 21st anniversary in business, so I guess it must celebrate Bowburn Consultancy’s “coming of age” too. I have a theory, which I have touched on before in these posts, that the success in conveying the wonders of nature to non-biologists is easiest when the audience can relate what they see directly to their own experiences. You only have to watch a typical David Attenborough documentary to see this principle at work: it may feature sumptuous photography in glorious landscapes, but the events portrayed are not so different to a typical Friday evening at the Bigg Market in Newcastle. The BBC Natural History Unit would find plenty of courtship activities, territoriality and several kinds of violence here, much of it set around watering holes. Who needs a plane ticket to an exotic location? As we lose that sense of empathy, so nature becomes “weird”. A few of us find fascination in the weird but we are a minority. Strangeness, however, brings problems, as I have commented before (see “Reflections from the trailing edge of science”) as stories cannot be conveyed using familiar metaphors drawn from our own experience. The example I used in that earlier post was the concept of “alternation of generations” in plants and my recent encounter with the red alga Lemanea a couple of weeks ago (see “Spaghetti Carbonara con Lemanea”) reminded me of a set of wonderful photographs by Chris Carter that illustrate this concept very well. 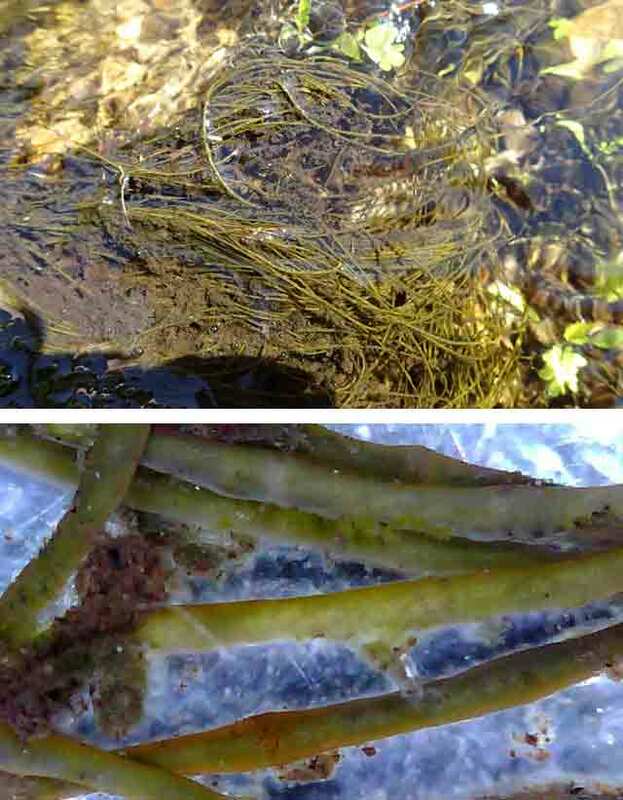 That post contained a photograph of Lemanea from the River Ehen in Cumbria which shows some of the wiry filaments growing on the stream bed. These filaments are, actually, hollow tubes of cells (see photograph in “The River Ehen in April”) along which there are a series of nodes. The nodes, in this case, bear sexual cells at certain times of the year (see “Lemanea in the River Ehen”). A cross section of a filament of Lemanea from the River Rede, Northumberland (photo: Chris Carter). Chris’ photographs shows how the Lemanea filaments are actually composed of a hollow tube of cells with an outer cortex. 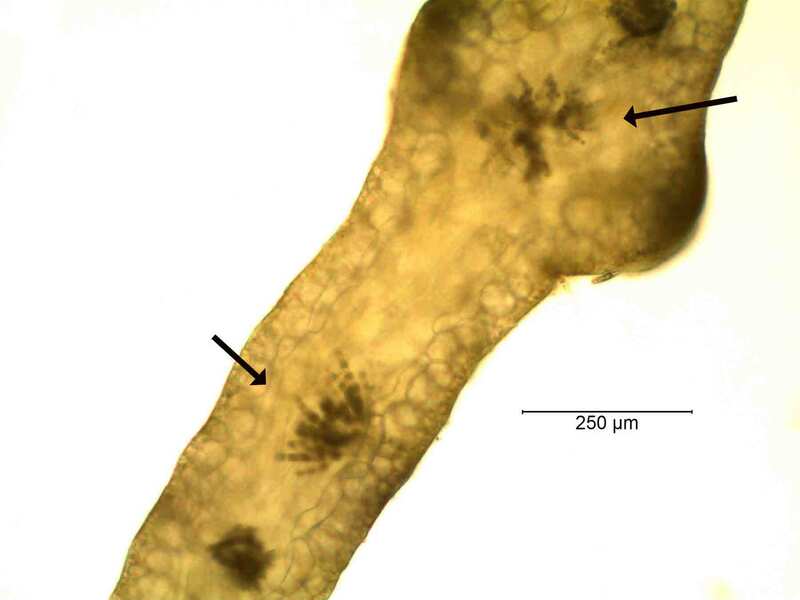 However, the centre of this tube is not completely empty, and the clusters of cells that we can see inside the tube are spore-producing organs called “carposporophytes”. At some point during the development of the carpospores, two cells fuse so that the carpospores is diploid (2n), rather than haploid (n). 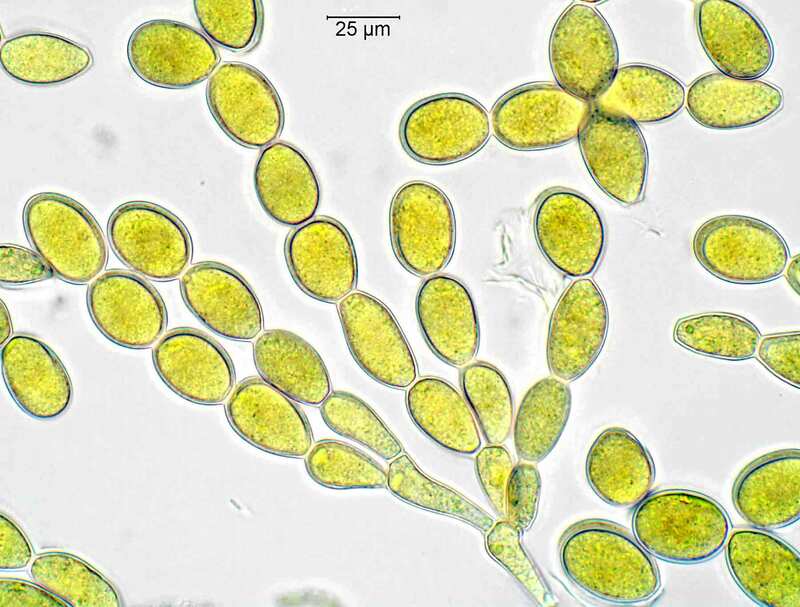 The carpospores are released when the Lemanea filament dies back in late Spring and these then germinate into a filamentous sporophyte (2n) phase, called the “chantransia”. At some point during the winter, these chantransia undergo meiosis, and the resultant haploid cells grow, still attached to the chantransia, into the next generation of gametophytes. Transapical view of a Lemanea filament; the arrows show the sporophytes (“carposporophytes”) inside (photo: Chris Carter). Finally, I have included Chris’ high magnification photograph of some of the cells of this carposporophyte plant, looking very similar to simple red algal genera such as Audouinella, which prompted my original series of posts on alternation of generations. These photographs capture my fascination with the algae: apparently simple, easily overlooked, but actually presenting sophisticated, highly-evolved solutions to survival under tough circumstances. The constant current in rivers makes establishing and maintaining a population at one place hard enough, more so when a “population” actually consists of two discrete stages. This has led some to suggest that the complexities of the red alga life cycle may be a form of “bet hedging”, spreading the risk of mortality between the life stages. 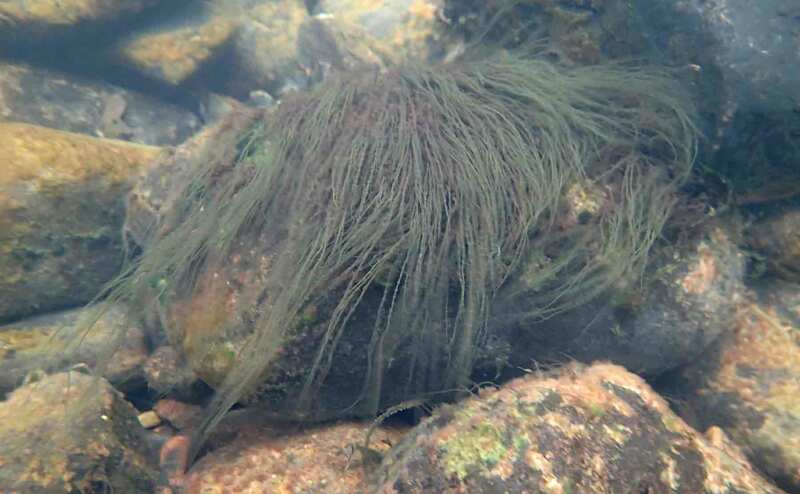 Having a large gametophyte phase, for example, gives the plants access to more light, making them more productive, but they are also exposed to the strong currents in the river, increasing their risk of loss due to scour. On the other hand, the smaller sporophytes (the “chantransia”) are protected from the ravages of the current because they live close to rock surfaces, within a “boundary layer” where current velocity falls off due to drag. It could be seen to be roughly parallel to the metamorphosis of butterflies and other insects, with phases of the life cycle optimised for different activities. 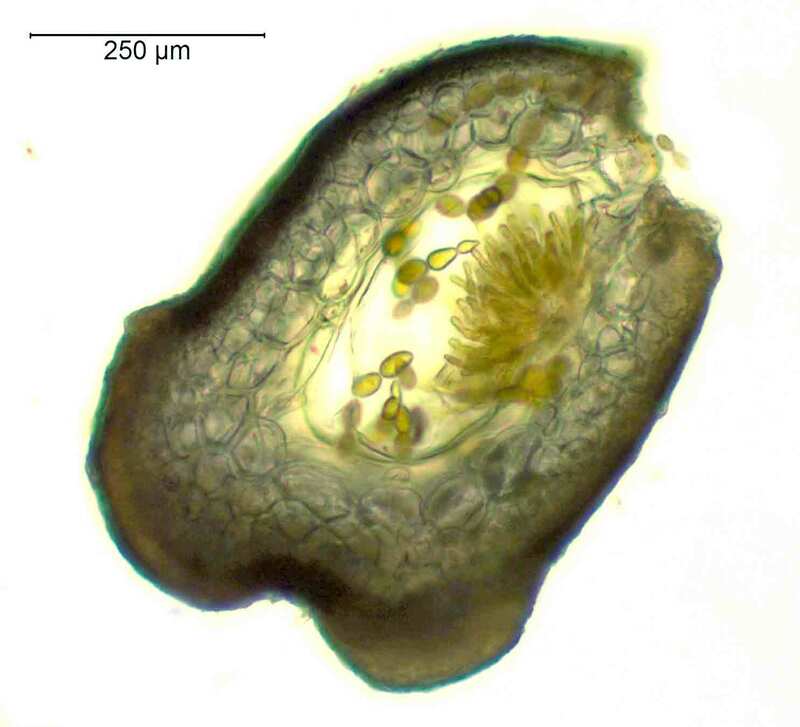 Lemanea faces a particular challenge: the gametophytes have “solved” (excuse the teleology) the challenge of living in very fast current speeds, where they have little competition from other plants and algae and, I would guess, little threat from grazing invertebrates. This gives the genus plenty of scope to thrive in fast-flowing upland rivers. There is normally a benefit to an organism of releasing spores and gametes into their immediate environment, as this encourages dispersal and cross-breeding. Were Lemanea to do this, the spores and gametes would be washed quickly downstream, away from their ideal habitat. The practice of keeping the carposporophyte inside the thallus, rather than on the outside, increases the chances of some of the carpospores finding their way to the rocks in the immediate vicinity of the gametophyte and, thereby, ensuring that the chantransia are well-placed to produce a new gametophyte generation the following year. It is all very complicated. This is, I suspect, partly because systematic biologists have a fondness for obscure terminology that makes it hard for the non-initiate to follow the twists and turns of life cycles. But it also, I suspect, a consequence of dealing with habits and life cycles that are unfamiliar and, more importantly, cannot be distilled down to simple, anthropomorphic metaphors. High magnification view of carpospores of Lemanea (photo: Chris Carter). Sheath, R.G. (1984). The biology of freshwater red algae. Progress in Phycological Research 3: 89-157. Fieldwork in March brings out the forager in me, as lush growths of the red alga Lemanea smother the beds of our upland rivers at this time of year. Considered a delicacy in some parts of the Himalayas, I started my own culinary experiments with it and, last year, had my first success (see “Freshwater algae on the menu … again”). This year, I have branched out a little further, and offer you my own variant of the classic Italian dish Spaghetti alla Carbonara, which you can find in most Italian cookbooks (interesting theory for the origin of the dish if you follow this link. The twist to my recipe is to replace the bacon or pancetta with hot smoked salmon. Gently fry a crushed garlic clove in a little olive oil whilst the pasta is cooking, then, add the salmon, cut into chunks (about 50 g per person), and turn for a couple of minutes. Drain the pasta and add it to the pan with the salmon and garlic. Now take it off the heat and stir in a mixture of beaten eggs (two per person) and parmesan cheese (about a tablespoon per person) plus salt and pepper. The key to a good Carbonara is to make sure that the eggs thicken to form a creamy sauce, and do not scramble. 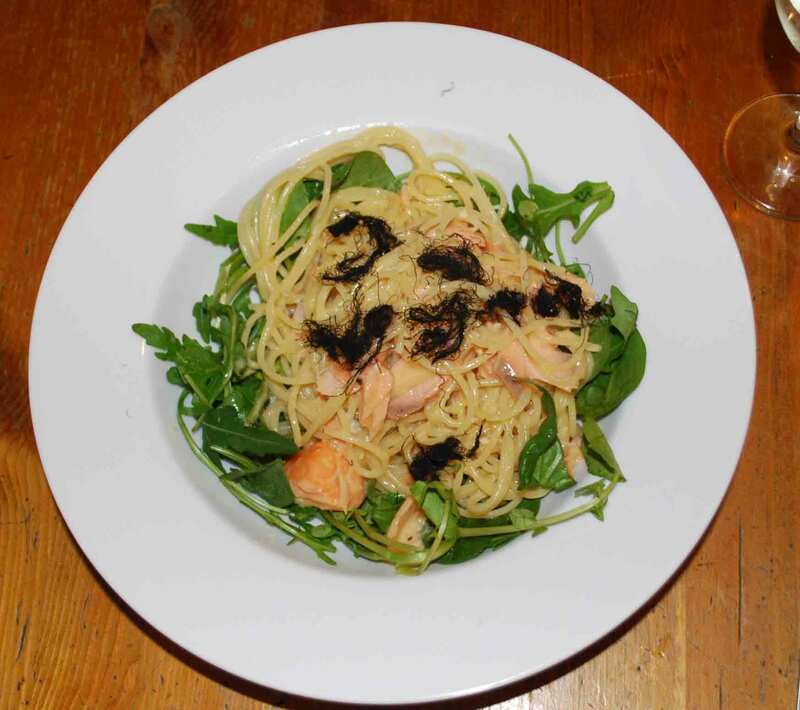 I added chopped filaments of Lemanea, prepared as described last year, as a garnish on top of the pasta / egg / salmon mix, and served it with a rocket and water cress salad. The alga has a distinctive fishy taste that complements, but does not overwhelm, the salmon. Not only delicious, but also less than 20 minutes from putting the pasta into boiling water to sitting down to eat it. Spaghetti alla Carbonara con Lemanea. The photograph shows Lemanea growing on a submerged stone (about 20 cm across) in the River Ehen, Cumbria in March 2016. The return of Masterchef to our screens at the same time that Lemanea is at its most abundant in our streams is too much of a coincidence for me. 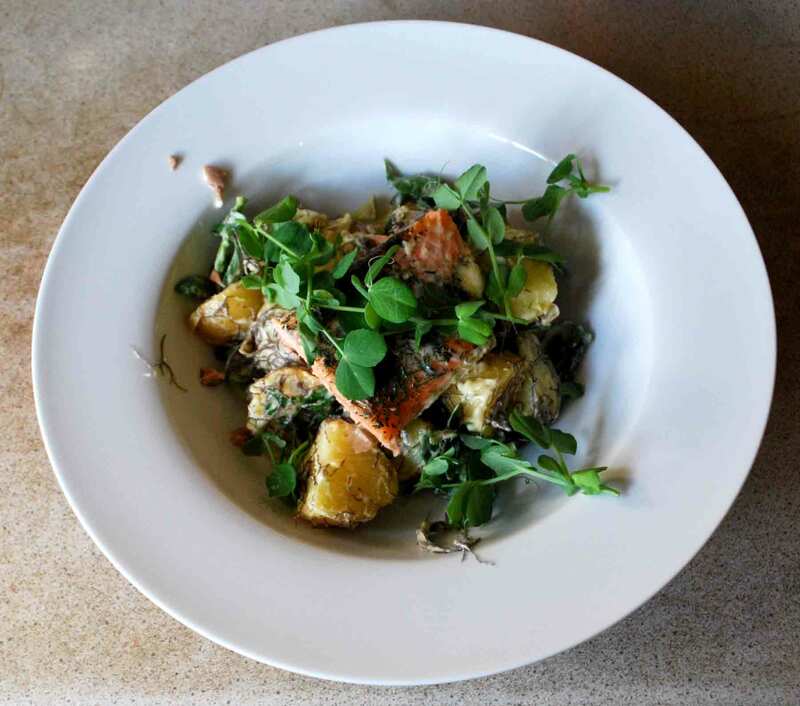 I have already written about my culinary experiments with the red alga Lemanea (which is eaten in parts of northeast India) and have been wondering for some time how best to use it in British cooking (see “Trout with sorrel, watercress and … algae”). 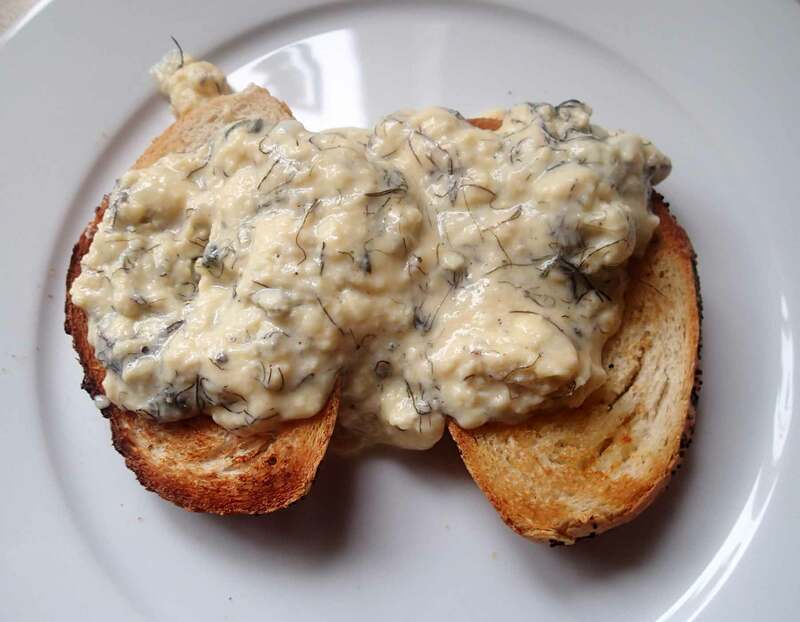 This year, I followed my instincts, in the wake of my experiments with Welshman’s Caviar after the Green Man festival last summer (see “Gastronomy in the Welsh hills”) and found that it can really enhance the flavour of scrambled eggs. This is how to do it: collect a few handfuls of young Lemanea from a stream. It is only common in streams that are relatively unpolluted, though it is tolerant of heavy metal pollution, so it pays to avoid areas where you know there is a history of mining. Wash the filaments in cold water to remove any particles, shake it dry and then spread it out on a plate and leave it at room temperature overnight to dry. Chop it roughly so that the fragments are about a centimetre in length. Finally, make your scrambled eggs in the usual way, but stir a generous handful of the dried Lemanea filaments into the mixture just as it starts to thicken. Cook whilst stirring for a couple of minutes, then serve on buttered toast. The algae gives the scrambled eggs a nice, fishy flavour without overwhelming the dish.